The Green Build’s landside project at San Diego International Airport (SAN) recently received the Envision Platinum award. Owned by the San Diego County Regional Airport Authority, the project is the first airport development to receive an Envision award and is also the 13th project to receive an Envision award. “The San Diego International Green Build project has intentionally included many of the key sustainable infrastructure characteristics in its new development, including many elements from the Quality of Life, Leadership, and Resource Allocation, as well as Natural World and Climate Risk areas, which are part of the Envision system’s rating categories,” said ISI President and CEO, Bill Bertera. 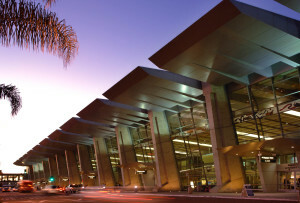 To access photos of the San Diego International Airport’s Green Build project, visit the Green Build photo gallery at: http://www.san.org/Airport-Projects/The-Green-Build.